For thousands of years, God-fearing women have looked to the noble, or virtuous (KJV), woman of Proverbs 31 as their ideal. Mary, the mother of Jesus Christ, probably had this role model of the virtuous woman in the forefront of her mind from earliest childhood. Most Jewish women did, for this poem was traditionally recited in the Jewish home every week on the eve of the Sabbath. But what about today’s woman? Of what value can this ancient poem be to the diverse, complex life-styles of women today? To the married, to the single, to the young, to the old, to those working outside the home or inside the home, to those women with children or without children? It is more relevant than you might at first expect — although it is also too good to be true. 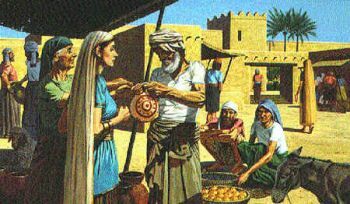 When we examine this ancient biblical ideal of womanhood, we do not find the stereotyped housewife occupied with dirty dishes and laundry, her daily life dictated by the demands of her husband and her children. Nor do we find a hardened, overly ambitious career woman who leaves her family to fend for itself. What we find is a strong, dignified, multitalented, caring woman who is an individual in her own right. This woman has money to invest, servants to look after and real estate to manage. She is her husband’s partner, and she is completely trusted with the responsibility for their lands, property and goods. She has the business skills to buy and sell in the market, along with the heartfelt sensitivity and compassion to care for and fulfill the needs of people who are less fortunate. Cheerfully and energetically she tackles the challenges each day brings. Her husband and children love and respect her for her kind, generous and caring nature. But with all her responsibilities, first and foremost, she looks to God. Her primary concern is God’s will in her life. She is a woman after God’s own heart. Let’s examine the characteristics of this remarkable woman — a role model for Christian women today. Does this woman sound too good to be true? Perhaps she is. The woman described here is an idealized woman, a composite of many capable women. After all, not all people have the same skills. Some women’s strengths are in music or art. Others may be in mathematics, teaching or business. Some are better managers and organizers than others. While some women may excel at coming up with ideas, others may be more skilled at creating or producing what has been invented by someone else. No one excels at everything. Some women work for several years after high school or college before marrying. Others, for one reason or another, do not marry at all. Does this mean that unmarried women cannot be Proverbs 31 women? No. Although this chapter describes a married woman, marriage and motherhood are not prerequisites for the successful Christian female’s life. The essential characteristics of the Proverbs 31 woman can be applied to the the single woman, too. The model woman described in Proverbs is a portrait of ideal womanhood. The focus of this portrait is a woman’s relationship with God, not her specific abilities or marital status. The Proverbs 31 woman realizes that regardless of her natural talents or acquired skills, or all her accomplishments, her strength comes from God. Who is a virtuous woman today? Proverbs 31 tells you that it is the woman who puts God first. The ideal woman of Proverbs 31 should encourage all women everywhere. Cultures change, but this woman’s God-inspired character still shines brightly across the centuries.